Calling all teacher & profs! I'm giving a virtual lecture today at 3 EST. I’m sure you have lot of questions, such as will I be wearing pants. Only your imagination will know the answer to that. 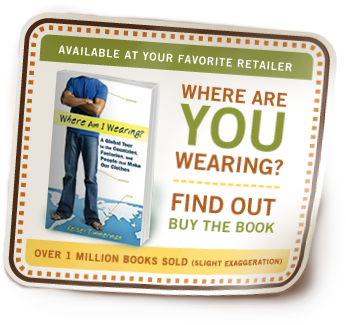 Attending the lecture will earn you 1 CPE credit, and, if you stick around until the end, I’ll hook you up with the never-before seen preface to the new edition of Where Am I Wearing? Kelsey Timmerman followed the labels of his clothes around the world to meet to the people who made them. During this Guest Lecture, Kelsey will bridge the divide between producer and consumer as he tells their stories and how they relate to issues such as globalization, poverty, child labor, global development, sweatshops, and individual and corporate social responsibility.